I recently attended an interesting gathering of journalists and guests at the Swiss Alpine Museum in Bern. All of us were there for the inauguration of the "Bikini in den Bergen" photo exhibition. Hotel and tourism advertising was one of the specialties of the Kunstanstalt Brügger, a printing company founded in Meiringen in 1878. 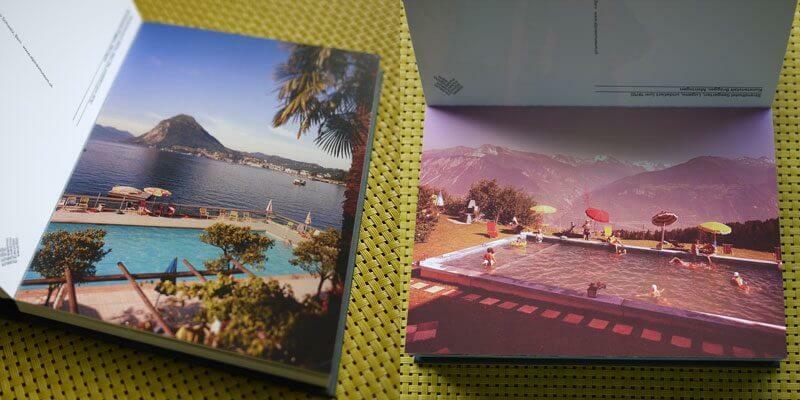 Thanks to the work of Brügger and his staff of professional photographers, we can now travel back in time to view swimming pools at various locations and spanning many decades. The company ceased its operations in 1994, and the extensive photo collection was transferred into the hands of the Cultural Foundation of the Bank Brienz Oberhasli. 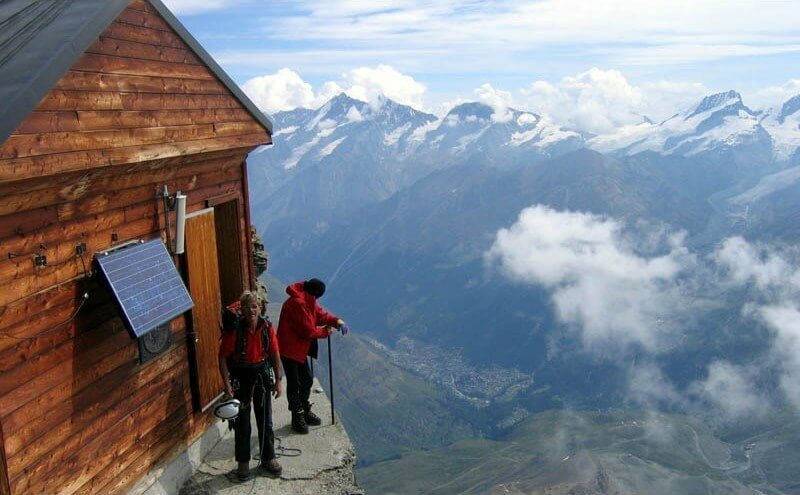 Then, in 2012, they were handed over to the Swiss Alpine Museum in Bern in order to enable the continued preservation and accessibility of the treasured works. 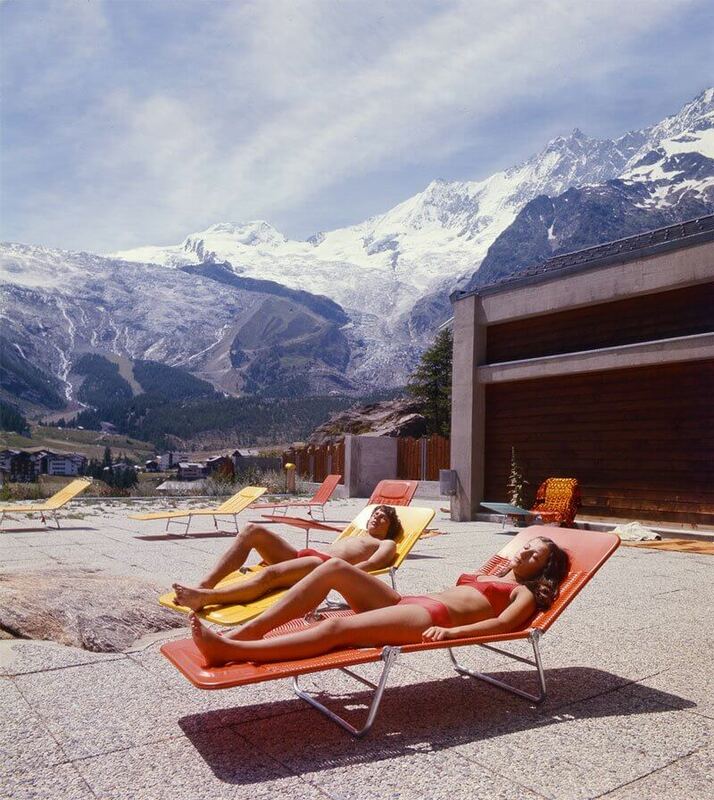 From a collection of around 100’000 photos, the Swiss Alpine Museum has selected 48 large-format color photographs for the exhibition. The original images are 55 x 75 cm in size. For the exhibit, they are now displayed as large format slides which can be placed on a light box for clarity. 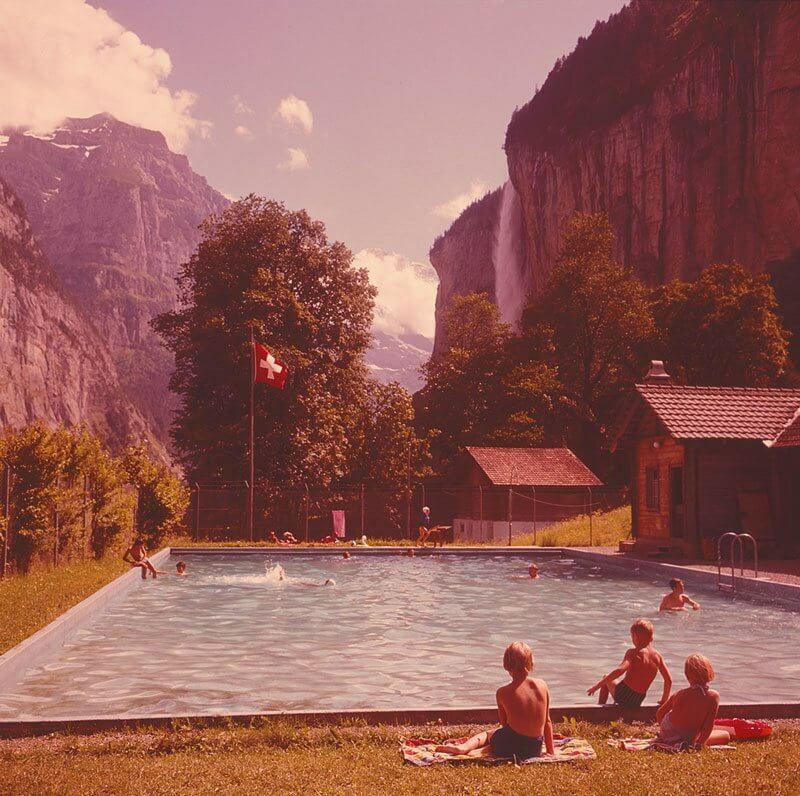 The photographs take you on a journey through Switzerland during the second half of the 20th century: There are swimming pools from Appenzell to Geneva, and from tourist hotspots in the Bernese Oberland to Valais and Ticino. In the 1920's, hotel swimming pools were constructed as separate entities. With the advent of World War I, the flourishing industry fell into a crisis and the pools did nothing much to boost tourism. But the post-World War II era brought with it new demands which centered on entertainment, amusement, relaxation and respite from increasingly hectic lifestyles. Hence, the hotel rooms of the 1950's were designed for recreation and entertainment. 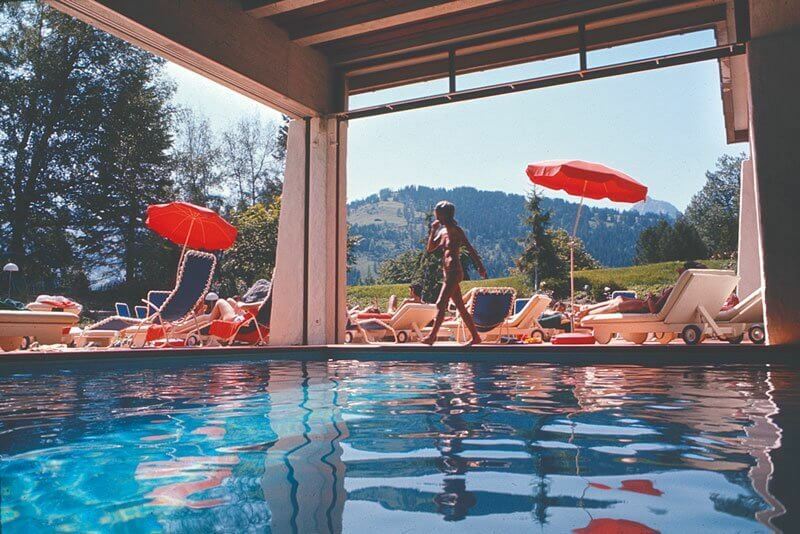 By the 1960's, there was an increase in financial and technical independence which enabled the revival of hotel swimming pools in a way like never before. 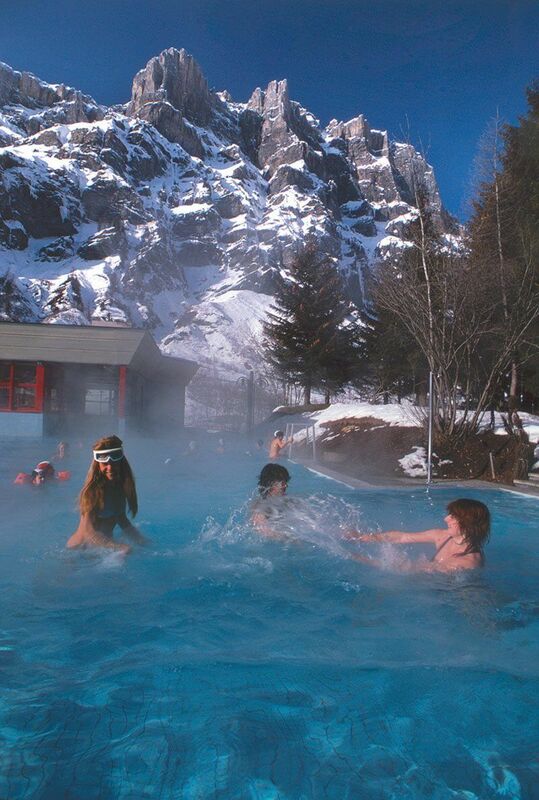 Many hotels seized this opportunity to expand and include swimming pools on the premises, enabling year-round recreation for their guests. The change in the modern world is far from over. Today, swimming pools are a major determinant for the make or break of a hotel. 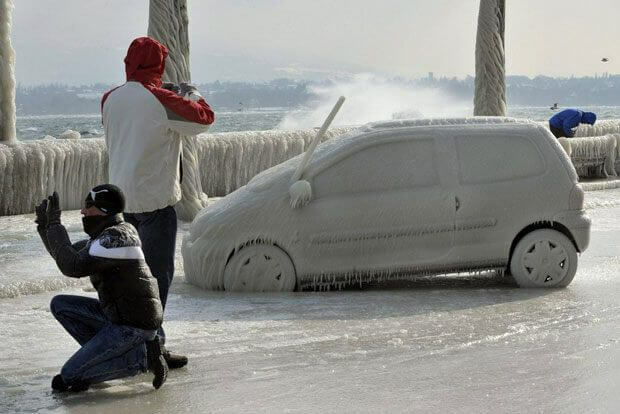 Size, technology, shape, lights and heating systems – you name it, it’s only getting better and better! How about taking a dive into eras where pools, people, landscapes and even bikinis told a completely different story?